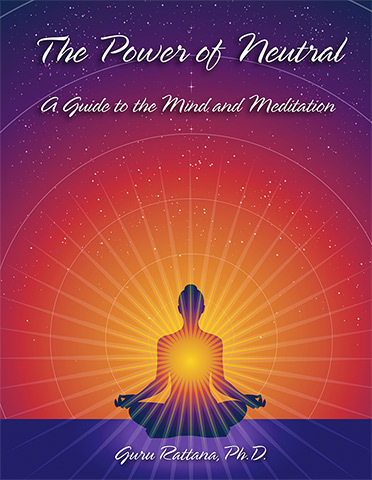 In this e-version of Guru Rattana's book, The Power of Neutral, you will find a distillation of the wisdom and experience she has gained over a lifetime of study and practice of the technology of Kundalini Yoga. This publication should occupy a prime position on the bookshelf of every student who wishes to deepen their knowledge and understanding of meditation and its role in spiritual transformation. Read Guru Rattana's explanation on how the mind works, her practical ways to direct your meditation practice, and take the keys she provides to open the door to your inner journey. In our usual asleep state, awareness is very limited and often monopolized by random thoughts or spaced out. There is a vast reality within that we are unaware of — our soul, the Infinite, inner peace, universal wisdom, and Divine Love. As we learn to access and pay attention to the neutral channel, our mental, emotional, and physical states begin to shift and harmonize. When we have access to the neutral channel, the dual mind can finally be relieved of the stress caused by thinking it has to figure everything out. In the neutral channel we can listen to the wise counsel of our intuition and hear our soul's voice direct our decisions. The neutral mind is our access route to higher love, peace, harmony, and oneness, all of which are not available in the dualistic mind. From the lighthouse of our neutral mind, we look at life differently. The following are the most basic guidelines to awaken and become aware of your neutral mind and inner space. Our first task in meditation is to pay attention to ourselves (to our bodies and inside our skin) with our subtle sensory faculties of (1) awareness, (2) listening, and (3) feeling. We train ourselves to use our sensory faculties to focus inside instead of outside ourselves. Use these faculties to direct your mind to be present to what you are feeling in your body. Get in touch with your physical, mental, and emotional condition. Don't analyze or think about anything. Deeply listen, feel, and be non-verbally present to your body and breath. Close your eyes. Look inside your head. Keep looking until you see a dark space. This space can be dark or light, but it is usually simply a dark cave-like space. Whatever you see (dark, space, nothing, empty, etc.) pay attention to that. Use your faculties of awareness and listening to tune in to the neutral space in your mind. The more you look, the more you will realize that this space is vast, pure, open, and totally available for you. Your primary and ongoing training then is to focus on the space inside your head. Do not get distracted by images, lights, or any other visuals that might appear. Look deeply beyond any thoughts or visuals. In addition to looking, engage your faculty of listening to listen inside your head. Listen between your ears, as though you have an inner ear inside your head. Listen deeply underneath any thoughts, until you hear the sound of silence. You will become aware of a "sound" that is always there. This is a constant infinite "sound of silence" that is very soothing and always in the background. It is normal that your attention will be diverted by thoughts in the dual mind, which continues to emit thoughts. Allow the thoughts, but don't pay attention to them. Engage your faculty of listening to pay attention to the sound of silence. Don't get involved in thinking, evaluating, analyzing, or judging what you are doing. You will notice that when you engage your attention on rational mind activities, you pop out of your neutral channel. Dwell in "My Sacred Space"
We quickly notice that our inner space is always there. We can always return to this place of peace, which is permanently in our psyche. The sound of silence is always present without discussion. This experience of permanency is comforting and reassuring. We begin to trust that we have an inner sanctuary to which we can always return. Think of it as my personal space. No one except me has access to my sacred space of peace. The Power of Neutral will show you how you can train yourself to simply (without judgment or frustration) return your attention to your sacred neutral space.